Neda is born in Iran’s Evin Prison, where her mother is allowed to nurse her for a few months before an anonymous guard appears at the cell door one day and simply takes her away. In another part of the city, three-year-old Omid witnesses the arrests of his political activist parents from his perch at their kitchen table, yogurt dripping from his fingertips. More than twenty years after the violent, bloody purge that took place inside Tehran’s prisons, Sheida learns that her father was one of those executed, that the silent void firmly planted between her and her mother all these years was not just the sad loss that comes with death but the anguish and the horror of murder. “Heartbreakingly heroic” (Publishers Weekly), Children of the Jacaranda Tree is an evocative portrait of three generations of men and women inspired by love and poetry, burning with idealism, chasing dreams of justice and freedom. Written in Sahar Delijani’s spellbinding prose, capturing the intimate side of revolution in a country where the weight of history is all around, it is a moving tribute to anyone who has ever answered its call. 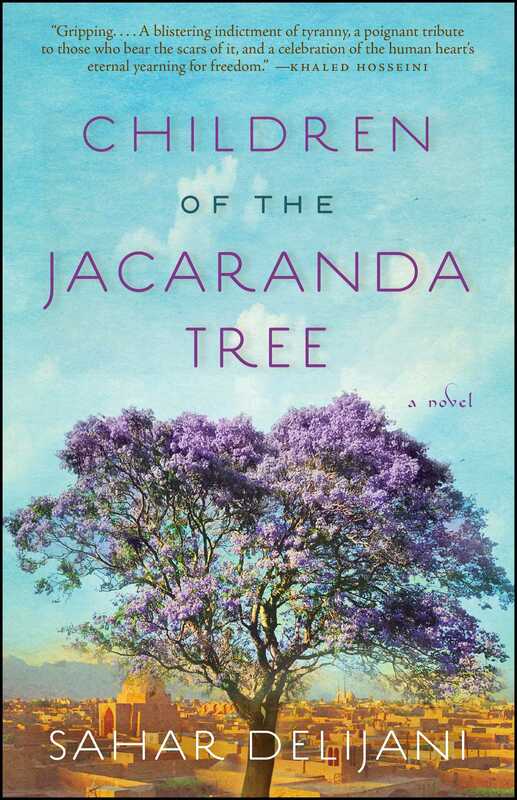 This reading group guide for Children of the Jacaranda Tree includes an introduction, discussion questions, and ideas for enhancing your book club. The suggested questions are intended to help your reading group find new and interesting angles and topics for your discussion. We hope that these ideas will enrich your conversation and increase your enjoyment of the book. Set in post-revolutionary Iran from 1983 to 2011, Children of the Jacaranda Tree follows a group of mothers, fathers, children, and lovers whose lives are forever changed by the Iranian Revolution and its aftermath. 1. Delijani’s gorgeous novel is based, at least partially, on the author’s own experiences—she was born in Iran in 1983—and the stories of her family and friends who lived through the Revolution. How are we to read her interpretation of the events that she describes? Can an author ever separate her own story from the fictional world she creates? Should she? How does our own history and upbringing affect how we as readers interpret what we read? 2. The capital city Tehran is the backdrop for much of the action in this story, and is in some ways almost a character on its own. And yet some characters are drawn to the city, against all odds and in the face of all logic, while others are lured away from it, for education, for safety, for reasons they can’t explain. How does proximity to the city affect the decisions different characters make? In what ways does landscape shape who we become? 3. The characters we meet throughout this book often don’t immediately seem to be connected, but it is slowly revealed how intricately intertwined their stories are and how each of their experiences brings them close to each other as if they were a family. In what ways is this like real life? How is it different? How do you think history plays a role in creating bonds between people that otherwise will not have existed? 4. The children born after the Revolution are affected by what happened to their parents, and to their country, in different ways. And yet each, in their own way, wants what Donya wants, to “finish everything their parents left undone.” (p. 223) How do you see each of the characters of the younger generation wrestling with this in different ways? Do you think this is a universal theme? Does every generation essentially fight the same fight? How do you see this in other cultures and other periods in history? 5. “Truth,” Sheida says, when she finds out her mother has lied to her about how her father died, “cannot have so many sides.” (p. 181) Do you agree? 6. “If it’s anything that can easily be articulated in an article, then it’s an insult to put the same thoughts and ideas into the language of poetry,” Omid says. “It sullies its essence, because poetry is there to say what cannot be said.” (p. 220) Do you agree with his sentiments? How does this affect the form this story takes? Why do you think the author chose to write a novel based on her family’s experiences instead of a nonfiction piece? Do you think poetry or a novel can ever communicate a message better than nonfiction? 7. “We all have a tree inside of us,” Ismael has told Azar. “Finding it is just a matter of time.” (p. 36) What do you think this means? How do the characters reflect this? What does the jacaranda tree represent? 8. For each character, in one way or another, there's some hope that accompanies them at the end of their stories. The only character who is left with nothing is Donya. Why do you think this is? 1. Research together the history of the Iranian Revolution of 1979 that set the stage for the rise of the Ayatollah Khomeini, whose brutal treatment of those who opposed his rule led to the events of this novel. Discuss how the characters respond to and are shaped by the history of Iran up to the current day. 2. Several recent movies have looked at Iran, including Argo, which was the Academy Award Winner for Best Picture in 2013 and centered on the Iran Hostage Crisis—precipitated by the Iranian Revolution—and For Neda, an HBO documentary about a young woman killed while she was protesting the contested election in 2009. As a group, view one of these films, and discuss how you see the themes of the book play out on the big screen. 3. The younger generation of characters in this story is deeply affected by the courageous choices their parents made. Take a few minutes to think about how your life has been affected by what your parents did when you were a child. Can you think of a period of time or a specific incident that showed you something you didn’t expect about them? Share with your group.